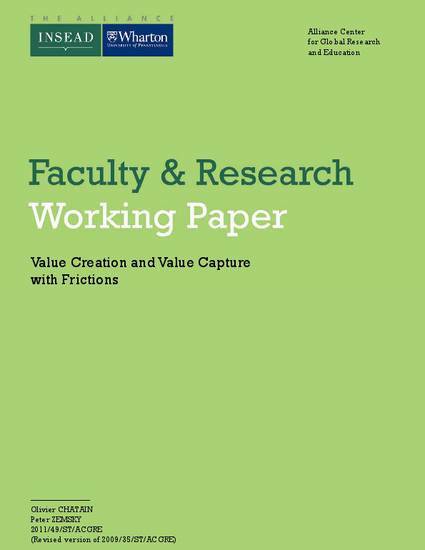 We use a formal value-based model to study how frictions in the product market affect value creation and value capture. We define frictions as incomplete linkages in the industry value chain that keep some parties from meeting and transacting. Frictions, which arise from search and switching costs, vary across markets and over time as, for example, products commoditize and competition becomes more global. Importantly, frictions moderate the intensity of industry rivalry, as well as the efficiency of the market. We find that firms with a competitive advantage prefer industries with lower levels of frictions than their disadvantaged rivals. We show that the impact of rivalry on industry attractiveness cannot be analyzed independently of other competitive forces such as barriers to entry and buyer bargaining power. We introduce resource development in our model to study the emergence and sustainability of competitive advantage. Firm heterogeneity emerges naturally in our model. We show that the extent of firm heterogeneity falls with the level of frictions, but sustainability increases. Overall, we show that introducing frictions makes value-based models of strategy even more effective at integrating analyses at the industry, firm and resource levels.